Visual Studio Code>Azure>Azure StorageNew to Visual Studio Code? Get it now. The Azure Storage extension for VS Code lets you deploy static websites and browse Azure Blob Containers, File Shares, Tables, and Queues. 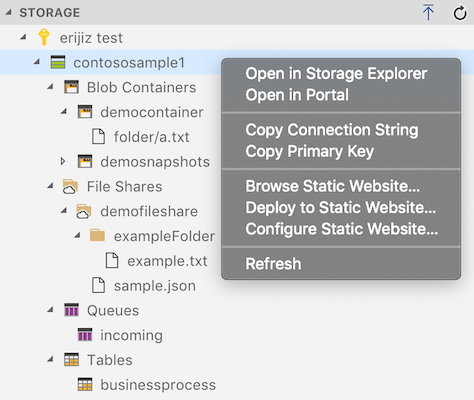 Follow this tutorial to deploy your web apps to Azure Storage from VS Code. Open in Storage Explorer for memory or computationally heavy tasks, or for upload/download of large or non-text files. azureStorage.preDeployTask: Set to the name of a task to be run before deploying a static website. azureStorage.storageExplorerLocation: [Mac only] Set to "Path/To/Microsoft Azure Storage Explorer.app" to override the default location. azureStorage.file.showSavePrompt: Set to false to prevent showing a warning dialog on File file save. azureStorage.blob.showSavePrompt: Set to false to prevent showing a warning dialog on Blob file save. Note that static websites are an Azure preview feature and is only supported for GPv2 storage accounts. Classic Azure Storage Accounts not supported. Viewing diagnostics and logs tables is not supported. Viewing the contents of tables and queues is not supported. Uploading or downloading binary files (except images) is not supported. Uploading or downloading of blobs is limited to text file types, block blobs and up to 4MB in size. Uploading and downloading of files in file shares is not currently supported. For these scenarios and other advanced features, please use Microsoft Azure Storage Explorer, which is free and available cross-platform for Linux, MacOS and Windows. Feedback on supported or desired features, as well as issues that you find, is always encouraged. Simply enter an issue. VS Code collects usage data and sends it to Microsoft to help improve our products and services. Read our privacy statement to learn more. If you don't wish to send usage data to Microsoft you can set the telemetry.enableTelemetry setting to false. Learn more in our FAQ.